First of all, let me say a huge CONGRATS! You're about to embark on an exciting new chapter in your life and I for one am so excited for you! 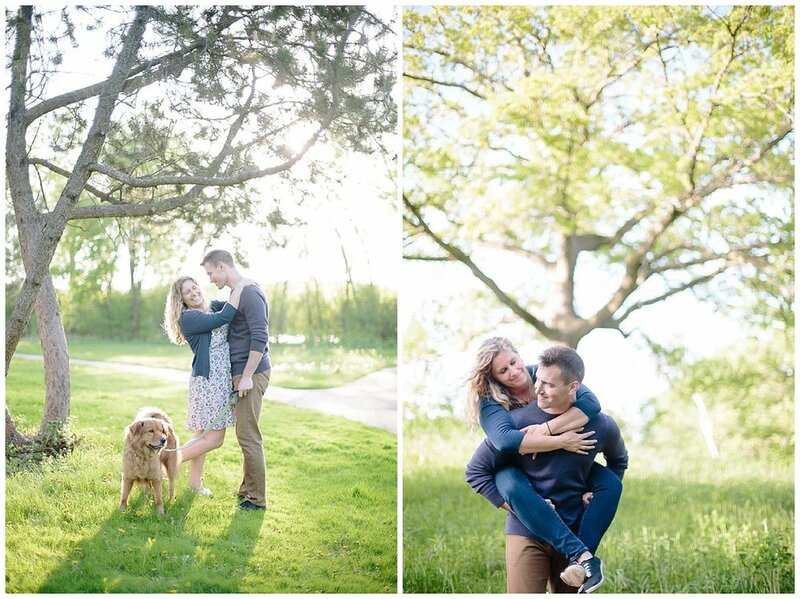 Now that that's out of the way, prepping for your engagement session can be a little stressful. Where do we go? What do I wear? What does he wear? There are probably a number of other questions going through your mind but have no fear, I'm here to help. When prepping for your engagement session there are a few things to keep in mind: this session is supposed to be fun and fancy-free. We get to play, get a little silly, and figure out how we all work together. This is the session where you learn what you can expect from me on your wedding day and where you learn that you're in great hands. Okay, down the the nitty-gritty. Once you've booked your session, you'll need to start thinking about location. Is there a special place of significance to you and your honey? Are you outdoorsy and want to showcase that in your photos? Do you want to shoot in the city or in the country? All of these are important questions to ask yourself. Now that you've selected where you want your photos to take place, here are some other tips to make sure you're 150% prepared for your session. OUTFITS: The number one most important thing with regards to outfits is to make sure you're comfortable in your clothing. If you're uncomfortable it will show in your photos and you will not be happy with them. Second, and this is just my opinion, but I would stay away from matching. Instead, coordinate your outfits. Avoid patterns, logos, writing, and other such distractions on your clothes, too. While this rule can be broken, solids are usually safer and photograph better. Layers work nicely and can double as a fast outfit change. Lastly, if you can't narrow down your outfit choices...bring them all! We can always decide together which outfits to use at your session. PREP YOUR GROOM: Your groom may be a total pro in front of the camera but for those who aren't, you should prepare him on what to expect well before for your session. Show him a few of your favorite engagement session photos and explain why you like them and why they're important to you. Comment on how they're "belly to belly" or "forehead to forehead" or "how he's nuzzling her with his nose." Show him that he won't just be smiling at the camera and showing your ring off. Guiding him in this way should help relive his shock when I ask him to get super close and cuddly with you. RELAX, HAVE FUN, AND TRUST ME: Remember, this is supposed to be fun! You're taking photos to document a special moment in your life and to celebrate the love you and your fiancé have for each other. Know that your I or any other photographer you might work with doesn't expect you to be a pro. Everyone takes a bit of time to warm up to the camera so just relax, lean into the potentially awkwardness of the first 15 minutes, and have fun! Trust that I've got your best interests at heart and that I'm only going to ask you to do something because I believe it will produce a photo you're going to love. Location and time: Do you and your fiancé have a special place? Do you enjoy being outdoors or are you homebodies? These questions will help us select a location for your engagement session. As for when in the day to shoot -- I prefer shooting 2 hours before sunset or 2 hours after sunrise. Whenever possible, I avoid shooting during "peak sun" times (between 11:00 a.m. and 3:00 p.m.). The sun is above head and creates lots of shadows...and trust me, no one wants raccoons eyes in their photos. Also, and this should go without saying but...PLEASE BE ON TIME! I realize things happen but please do your best to arrive on time. I hope these tips help! Now, shake it off, get ready for some fun, and let's take some amazing photos together!